Home » Credit » Loans » Taking a student loan ? be careful! Taking a student loan ? be careful! Borrow as little and as late as possible: the week the money comes it should be paid out to the college: So if your last day for paying fees is 31st July, make sure that your loan is disbursed on say 23rd, not on the 5th of the month and the money lies in your own account. Borrow the minimum amount that you HAVE TO borrow: Use most of your past savings, scholarships, money from parent, ….and then go and borrow the minimum amount that you MUST. Look real hard for part time work and save up that money (see if you can ask the bank for some mode of prepayment if it is possible). Remember that CIBIL is watching your repayment – so take decently difficult loan amounts, but not so difficult to make you pant and default. Be prepared for a recession when you finish! It is not the most encouraging advice, but be careful about a recession exactly when you finish your degree. Ouch it hurts, but being prepared is better than not being prepared. When you start to repay, stretch an repay. However if you cannot, GO TO THE LENDER before he comes to you. But remember ‘deferment’ hurts real bad. It is just a way of postponing your payment – and in that period interest at high rates are being recovered from YOU. So be careful. Borrowing to pay fees for higher education is an emotional product – the more care you take, the better it is – do not suffer this myth. A foreign degree is useful only if you are seeking to make a career abroad. That in turn depends on whether you really want to live abroad all your life, etc. 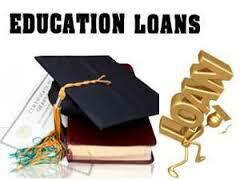 Very very good high quality Indian education is available, explore that first. For all higher studies many scholarships are available – exhaust them first. See, research, re research, ask, ….you may land up with some part scholarships. After all these efforts arrive at a sum of money that you MUST borrow….all the best!